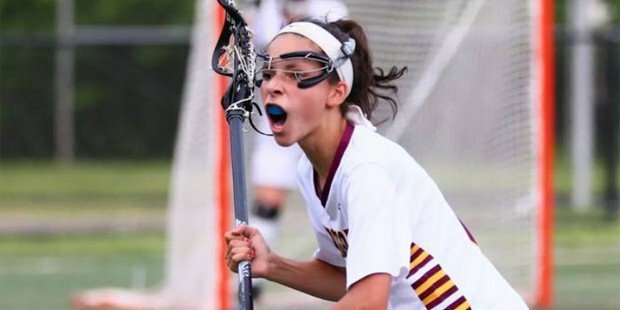 University of Maryland bound senior Libby May scored a game-high six goals, Friday, helping the Hereford girls lacrosse team open its 2019 season with a 15-11 win over North Harford. The Bulls built a big first half lead, taking an 11-4 advantage to the break. North Harford battled back in the second half, but never threatened the Bulls’ hold on the contest. Isabella Peterson added three goals for Hereford, while Bella Carano and Katie Blair scored twice each. The Bulls also got a single goal from Chloe Park, one goal and one assist from Jordan Peterson and two assists from Lindsey Clarke. North Harford’s Lauryn Warfield was the top point scorer in the contest with five goals and two assists. Brenna Duley had two goals and an assist for the Hawks and Brooke Ciampaglio scored twice. In addition, Anna Racine and Lily Macatee scored one goal each. Pictured above: Hereford’s Libby May scored six times in the Bulls season opening win over North Harford.